Happy holidays 2018 from Suffrage Centennials! Happy holidays from Suffrage Centennials. 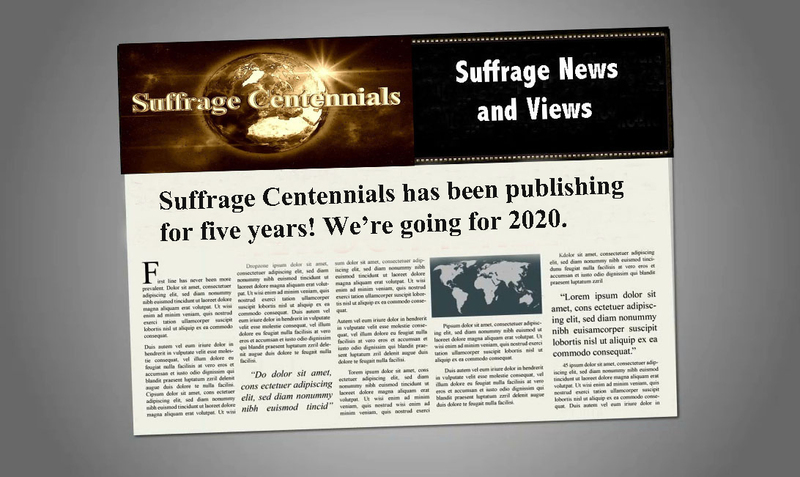 We have been publishing since 2013 and we’re going strong in the direction of 2020, the U.S. suffrage centennial. During 2018, the UK held an observance of its suffrage centennial where many, but not all of its women citizens, won the right to vote in 1918. France followed in 1944. Unfortunately we aren’t able to cover all suffrage movements around the world. However, if you have an article or news item to share, please get in touch! Expand our sphere of influence. Let’s get busy during 2019 preparing for 2020 when the US will be observing 100 years of women voting with the 100th anniversary of the ratification of the 19th Amendment to the US Constitution. This entry was posted on December 25, 2018, in Blog and tagged 2020 centennial, suffrage centennials. 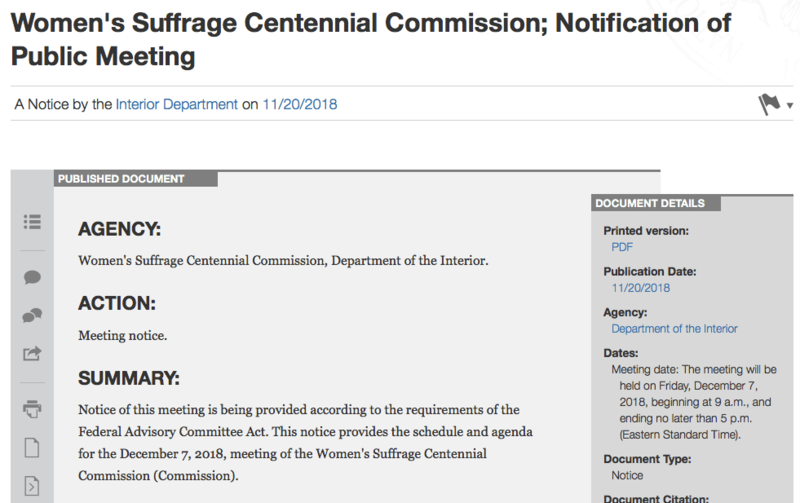 US WOMEN’S SUFFRAGE CENTENNIAL COMMISSION NEWS! We’ve been advocating for celebrating the 100th anniversary of women voting in 2020 since we took a blogging tour of the “Cradle” of the women’s rights movement in the US. The number of planned events for 2020 and the 100th anniversary of womens’ right to vote will make a leap on December 7, 2018 with a meeting in Washington, DC. at the Belmont-Paul Women’s Equality National Monument, 144 Constitution Avenue NE, Washington, DC 20002; in the Allender Gallery on the 2nd floor. For more information, contact Kim Oliver, Designated Federal Officer, Women’s Suffrage Centennial Commission, 1849 C Street, NW, Room 7313, Washington, DC 20240; phone: (202) 912-7510; fax: (202) 219-2100; email: kmoliver@blm.gov. WHAT TO KNOW ABOUT THE FEDERAL WOMEN’S SUFFRAGE CENTENNIAL COMMISSION? The duties of the Commission, as written in the law, include: (1) To encourage, plan, develop, and execute programs, projects, and activities to commemorate the centennial of the passage and ratification of the 19th Amendment; (2) To encourage private organizations and State and local Governments to organize and participate in activities commemorating the centennial of the passage and ratification of the 19th Amendment; (3) To facilitate and coordinate activities throughout the United States relating to the centennial of the passage and ratification of the 19th Amendment; (4) To serve as a clearinghouse for the collection and dissemination of information about events and plans for the centennial of the passage and ratification of the 19th Amendment; and (5) To develop recommendations for Congress and the President for commemorating the centennial of the passage and ratification of the 19th Amendment. Sandra Weber will present a program about Inez Milholland at the Susan B. Anthony Museum & House in Rochester, New York on December 3, 2018. It is part of the museum and house lecture series in its 16th year. Milholland is the US suffrage martyr. The National Women’s Hall of Fame is celebrating 50 years in operation in Seneca Falls, NY. Their good news has to do with reaching the level of funding desired so the organization can move to the historic Seneca knitting mill, an 1844 landmark. On Christmas day in 1916, women from all over the nation gathered in Washington, DC for a memorial service honoring Inez Milholland. They called her their suffrage martyr. Doris Stevens in her 1920 book, “Jailed for Freedom,” honored Inez in this selection from her book published by Librivox and edited by Suffrage Wagon News Channel. In 2016, the National Women’s History Project honored Inez in a year-long observance chaired by Marguerite Kearns and Robert P.J. Cooney Jr. Martha Wheelock and Wild West Women produced a 15-minute film distributed to thousands of individuals, organizations, and schools throughout the nation. Suffrage Centennials was a partner in this centennial observance. Visit InezMilholland.wordpress.com for updates about Inez Milholland and the 2020 centennial observance of the ratification of the 19th Amendment to the US Constitution. We are supporting all efforts to remember Inez during 2020, the nation’s suffrage centennial when American women will have been voting for 100 years. suffragecentennials.com works hand in hand with LetsRockTheCradle.com, a public service working with communicators spreading the word about the 2020 centennial for women’s voting rights. Refer writers and editors, bloggers, communicators, educators, and others to the Cradle site so that the women’s suffrage centennial gets the coverage it needs. It’s the 100th anniversary of women voting in 2020 with the celebrations of the 19th Amendment to the US Constitution that commemorates the anniversary of women’s right to vote. This entry was posted on November 29, 2018, in Blog and tagged 2020 centennial, Inez Milholland, Suffrage Wagon News Channel.